Home » Tourism • Travel Graphs » 12 Backpacking Hacks for Your Next Trip! 12 Backpacking Hacks for Your Next Trip! Are you preparing to set out on a backpacking endeavor? Are you struggling to find ways to fit all necessities in your backpack, or are you not quite sure what to even pack? The team of backpacking experts at Just Roughin’ It Adventure Company have compiled a few awesome backpacking tips to make your next adventure easy, fun and cost-effective. 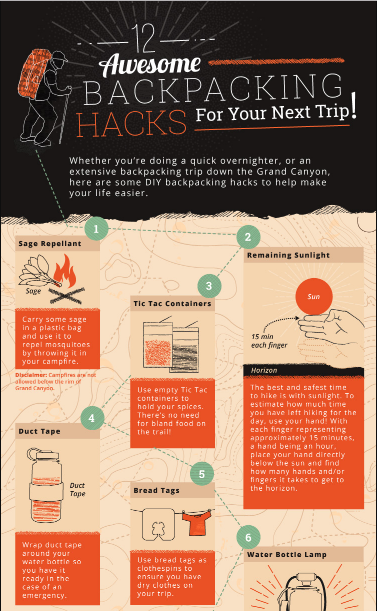 The infographic includes low-cost, simple backpacking hacks, such as using dental floss as fire starters and fishing line and storing eggs in water bottles. Also, don’t forget to bring your Crayola crayon on your next trip as crayons can burn for thirty minutes and can be used in case of emergencies. Whether you’re going for one night or a week, these DIY backpacking hacks are guaranteed to impress your friends, all the while making your next trip efficient. In addition, these tips are cheap and allow you to focus your backpacking expenses on more important gear like good quality shoes!